If you are looking for a place to celebrate the best Valentine’s Day Escapade, look no further than Thousand Hills Golf Resort as this great vacation destination offers some of the best cabins in Branson for you to enjoy a wonderful stay with your loved one. The resort is a perfect place for romance during Valentine’s Day as it is packed with lots of exciting activities for couples and families. The place is the best destination for romantic couple who wants to enjoy a wonderful stay while at the same time enjoying a great view of the picturesque natural scenery, beautiful wildlife, and the pristine lakes. Spending Valentine’s Day in Branson with the family, friends or loved one is a great time to enjoy because there isn’t much crowd during the season. But even during this time of year, there are still countless events and activities for you to enjoy. As there are not many lines in the shops and restaurants, going place to place is always easy. This time, you will be feasting on great items that are easily available and lower in prices as compared to a peak season where there’s always big crowd of shoppers that contributes to uneasy and inconvenient shopping. With the proximity of world-class live entertainment shows and exciting attractions from your cabin accommodation, your romantic Valentine’s Escapade with your loved one will surely be lively this love month. Beautifully located in a secluded place, cabins in Branson are some of the best accommodations in the Midwest where you can enjoy luxury and comfort at affordable price. Cabin accommodations at Thousand Hills ensure guests a luxurious and comfortable living in a rustic and tranquil environment that cannot be enjoyed in regular hotel accommodations. The cabins at Thousand Hills offer every guest a comfortable stay as they all feature modern amenities and stunning wildlife scenery. Your wonderful stay at any of the cozy cabin accommodations at Thousand Hills gives you the opportunity to play the most popular 18-hole golf course in Branson. In this beautiful golf course, you will certainly appreciate the spectacular landscape that surrounds the area and the panoramic rolling hills that you can see around the Ozark mountains. While enjoying a comfortable and luxurious way of living in the cozy cabin accommodation at Thousand Hills, you will know the reason why many people visit Branson year after year and choose to stay in a cabin and decide to come back again. As guest of Thousand Hills Golf Resort, you have the options to choose among cabin units that range from 1 bedroom, 2 bedrooms to 4 bedrooms. 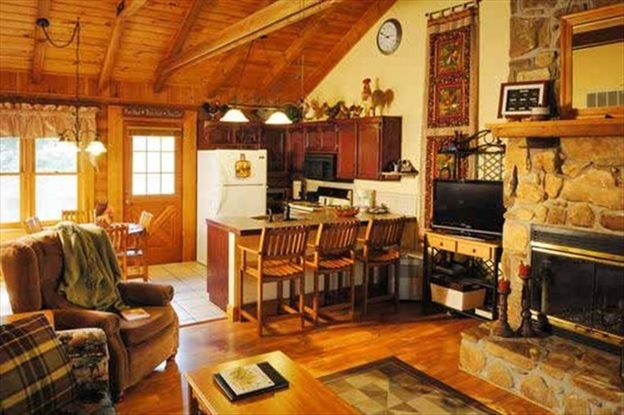 Cabin accommodations in Branson which haven’t been patronized by vacationers for many years, became popular to many visitors after many clients testified excellent service that they have enjoyed. So, if you want to enjoy the best Valentine’s Day Escapade with your loved one, get a cabin accommodation at Thousand Hills where you can enjoy a luxurious and comfortable vacation experience.